I previously ordered the wrong one that one had a magnet strap which was awesome this other one I received didnâ€™t it also didnâ€™t have the actual wallet but but undid the stitching and now have a place for money. But on the whole it will do. We are sorry to hear what has happened to your case. Please contact Customer Services so they are able to tell you your options regarding this. Quite a nice case but doesn't seem to have magnet to keep it closed. It's very smooth but slipped out of my grasp a couple of times, did protect my phone though. I love the colour and fit for my iPhone 8 plus. Only had this for one week and the plastic casing has already snapped! Very poor quality and not worth the money. Brilliant wallet cas - love it! 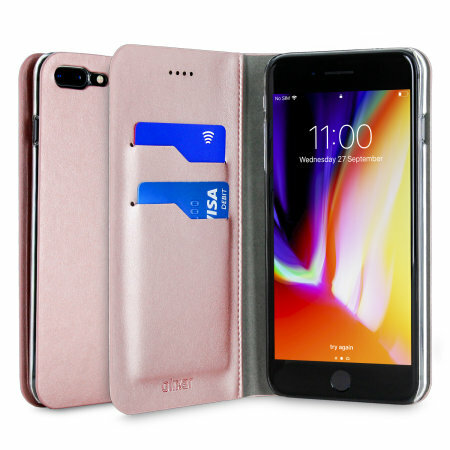 This wallet case is the perfect colour match for my rose gold iPhone 8 Plus. The fit is superb, it is lightweight and lovely to the touch. It is the first wallet case I have bought and I just love it. Would highly recommend it. Okay so I got this cover because the cover I actually wanted wasn’t available on the iPhone 8 Plus. However I have to say I’ve dropped this a couple of times and it seems to have saved my phone. In which case I will give it a massive thumbs up. Also a person that doesn’t normally leave reviews so I hope people pay attention. Happy with the case that complements the phone beautifully I think a magnetic close would improve this item but it is still ok without it. Was really looking forward to this new case for the iPhone 8 plus that just came out. I didn’t like that it didn’t have enough pockets and as soon as i put m phone in the case it cracked all the corners of the phone case! I haven’t even dropped the case with the phone yet. Not impressed with rbe quality as I was hoping. Rose Gold Looks good very pleased with this wallet. Rose Gold very good match to phone. Wallet looks good. Thanks for my phone cover. Am very happy with my purchase, great service and good communication, will definitely use your company again. Love the luxurious feel and sleekness of this rose-gold wallet case for my iPhone 7 plus. It is an exact match to my rose gold iPhone. Perfect for my iPhone 7 Plus. Excellent quality cover to protect my phone. Great matching colour. Needs more pockets. Good colour match to my rose gold iphone7. Not as many pockets as I hoped. This cover is very similar to the one I had for my iphone5 and I expected the long left flap to have a pocket behind the credit card slits. Alas on this cover it is stitched down, so I was a bit disappointed. What is new and handy is the way the right side bends to form a stand for the phone. Great quality case, delivery very quick, price excellent. I will definitely use this company again. I ordered a rose gold wallet case for a new iPhone. It's arrived within a few days. Good. But it is a very slippery fabric, so I fear I will drop my phone even more easily than in its natural uncovered state. I can't grip it as easily as the phone alone. So I'm wondering if I need to look again for a more practical case. Disappointing!